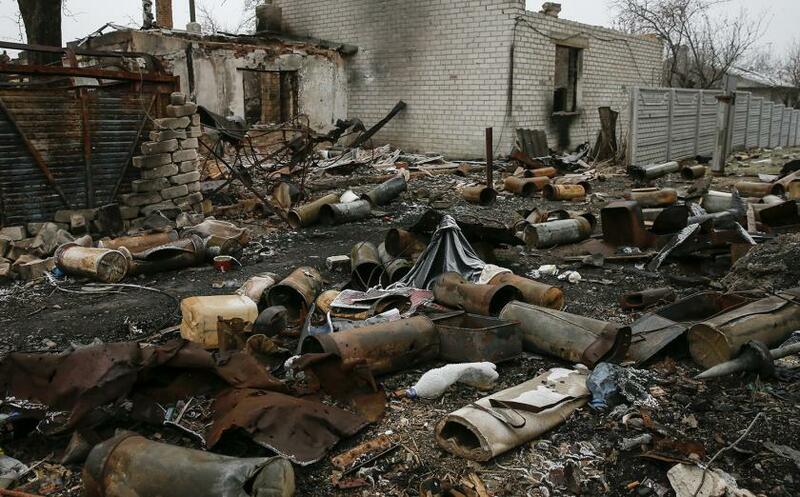 Ukraine’s Donbas bears the brunt of toxic armed conflict. Il programma dell’Onu sull’ambiente , UNenvironment, pubblica in questi giorni un drammatico report dalla regione di Donbas, zona orientale dell’Ucraina, dove da anni si combatte, si uccide e si muore senza che da noi in Europa occidentale se ne parli come si dovrebbe. L’Unep traccia un resoconto della situazione dal punto di vista ambientale che pubblichiamo per intero in inglese di modo che non dare adito a equivoci. L’area, ed è per questo che c’è una guerra, è fortemente industrializzata soprattutto per le miniere di carbone e per la presenza di altri metalli pregiati. La Federazione Russa appoggia palesemente i guerriglieri di Donbas che si vogliono staccare dall’Ucraina. Ed è questo il motivo per cui anche l’UE ha applicato le sanzioni contro i russi. L’inquinamento prodotto dal migliaio di industria presenti si somma a quello dovuto ai bombardamenti e all’uso di mezzi bellici di ogni tipo. Tra l’altro si calcola che per bonificare le zone di guerra dal materiale inesploso ci vorrebbero decenni se la guerra finisse oggi. La regione di Donbas è anche zona di grande biodiversità con aree di natura importante che andrebbero salvaguardate e invece sono abbandonate in mano ai bracconieri e a i tagliatori illegali di legname. L’inquinamento sta distruggendo la fauna ittica del fiume Siversky Donets, già prima del conflitto in pessime condizioni. L’acqua del fiume, oltretutto, sta trasportando i veleni nel grande fiume Don, di cui è tributario, nella confinante Federazione russa. Ukraine’s eastern Donbas region is an area with a fairly favourable climate, home to high plant biodiversity. In spring, several species of feather, sheep fescue and blue grass as well as forget-me-nots, and yellow cress, blossom in its steppes. It also possesses a wealth of mineral resources which include deposits of rock salt, gypsum, raw cement materials, flux limestone, and dolomite as well as granite and clays. But Donbas is hardly famed for its biodiversity. For years it has been one of the country’s most polluted regions – as toxic waste from nearly two centuries of intensive coal mining, and chemical and metal industries accumulated in its soils. The region’s economy continues to this day to be dominated by the coal industry, machine building, metalworking, and production of construction material. The region’s Donetsk province, which contributes over 23.5 per cent to Ukraine’s exports, is home to 1,000 enterprises and organizations. A significant amount of Donbas’ rural land – 80 per cent of which is arable – is also controlled by agricultural enterprises and farms, adding another source of pressure on the already threatened 50 mammal species, 38 species of fish, over 10 species of reptiles, and about 300 birds inhabiting the area. Additionally, the ongoing armed conflict – one of the bloodiest in Europe since the 1990s Balkans wars – has added another layer of significant and partially irreversible damage to local ecosystems. A year before the war broke out, the region hosted 5,500 industries which produced 4.3 million tons – equivalent to 44 per cent of the country’s emissions. Due to destruction of production infrastructure and emergency mechanisms, environmental degradation risks have significantly increased. And the damage doesn’t stop there: the Siverskyi (Seversky) Donets River – the most polluted river in Ukraine before the conflict – is a tributary of the Don River, flowing through the neighbouring Russian Federation. Pollution of the 650-mile long waterway, generated by the conflict, continues to pose health risks for the population living along the Don, for whom the river is the main source of water. Suspension of farming gave weeds and rodent mice space to thrive and reproduce, further endangering public health. 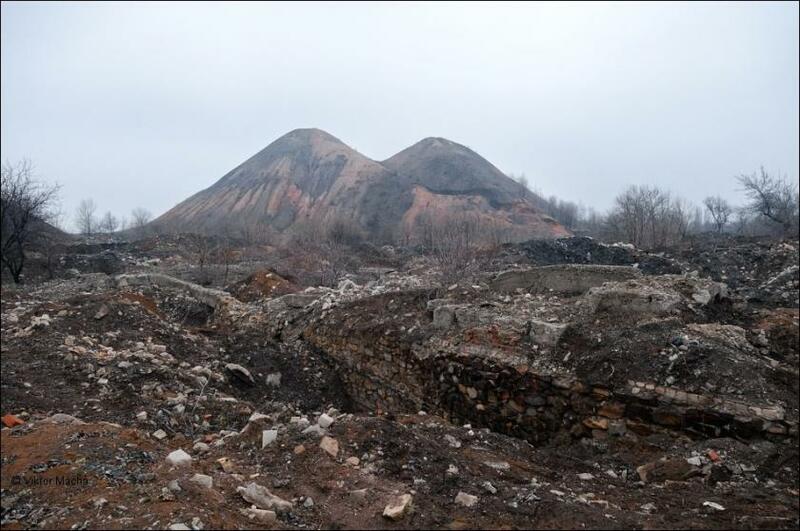 “Donbas is on the precipice of an ecological catastrophe fueled by air, soil and water pollution from the combustion of large amounts of ammunition in the fighting and flooding at industrial plants. There is an urgent need for ecological monitoring to assess and minimize the environmental risks arising from the armed conflict,” said UN Environment Programme Analyst Dr. Leila Urekenova. During the war, institutions which protect nature reserves have lost staff. This has led to an increase in environmental law violations, massive poaching, illegal logging and the disruption of waste management operations. Invasive species such as jackal, sunfish and the Asian lady beetle have also expanded and colonized the conflict zone and adjacent areas. The forests in the Donetsk and Lugansk provinces of Donbas region play a crucial role in the natural and man-made landscapes, by preventing wind and water erosion and by ensuring the stability of water supply bodies. Besides creating a favourable environment for the local fauna and flora, the region’s massive pine forests play a key social and economic role, as they are often used for recreation, hunting, and mushrooms, berries, and herbs picking. According to an assessment carried out by UN Environment’s Science-Policy Platform on Environment and Security, the conflict has affected, damaged, or destroyed ecosystems within an area of at least 530,000 hectares, including 18 nature reserves covering an area of 80,000 hectares. Furthermore, 150,000 hectares of forests have been impacted, with 12,500 forest fires blazing through the military operations zone and adjacent areas. A Ukrainian military field camp near Dmitrivka in the north of Luhansk. 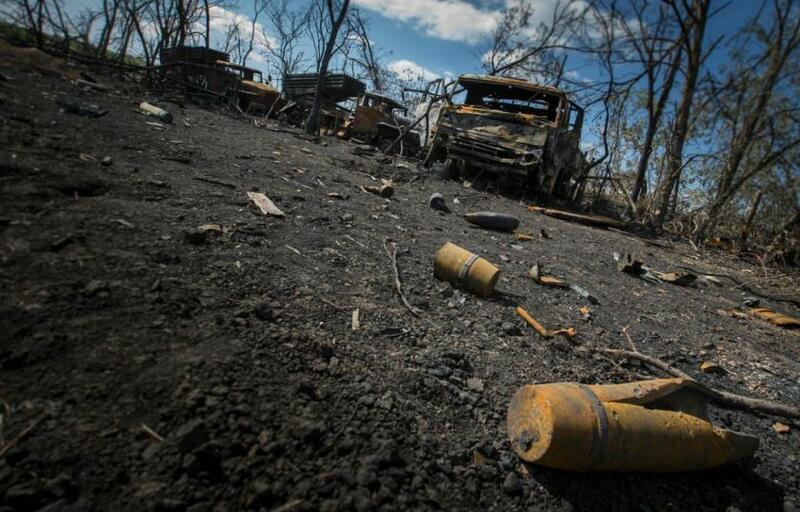 The forests in Donbas have been impacted by mechanical and chemical components of weaponry used in the conflict. Photo by Jan A. Nicolas/DPA/PA. In 2014 alone, the lack of forest protection and the fighting led to the near irreversible destruction of 479 hectares of forests. The fighting has had direct mechanical and chemical impacts on trees, including shrapnel damage of barks, branches, tops, ground vegetation, weakening or killing individual trees and entire plantations. The military operations zone has also been contaminated by unexploded ordnance whose elimination could take years or decades, based on the experience of other countries such as Bosnia and Herzegovina, Serbia, and Macedonia.